Protecting and enhancing our natural environment and reducing the impacts of our everyday consumption and waste generation - locally to globally - are challenges, opportunities and obligations that together as a community we must continue to respond to, now and into the long term future. Since the installation in February 2012, the panels, to January 2014, have produced 65.61 MWh and we have avoided 93.73 tonnes of CO₂emissions. 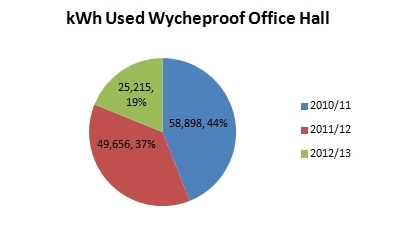 Wycheproof office/hall has decreased energy usage from the grid by 34 % for the 2012/2013 financial year compared to the 2011/2012 financial year. During the 2011/12 financial year, Buloke Shire purchased 518 Mega watts of Green Energy for our buildings and 718 Mega watts of Renewable energy for our Public lighting. The Sea Lake office solar panels generated 12 mega watts of energy that went back into the grid which we were credited for. 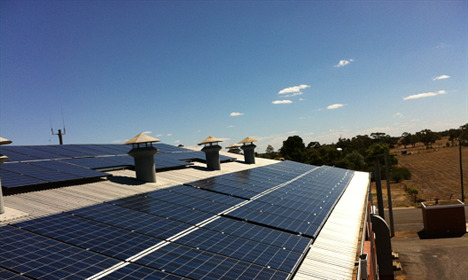 We used 903,185 kWh of electricity for all of the Shire's operations which generated 964,601kg CO2.